Plymouth Artisan Cheese is a granular curd cheese. Granular curd cheese is similar to cheddar but is created through the skillful cutting and continuous stirring of the curds. The cheese is made from additive-free, raw cow’s milk. The milk comes from a single herd close to the factory. This locally-sourced approach ensures a freshness, consistency, and quality that mass produced cheeses simply cannot match. There are a variety of Plymouth Artisan Cheeses styles, including smoked, herbed, peppered, cave-aged wheels, curds, and the classic, original Plymouth Cheese. 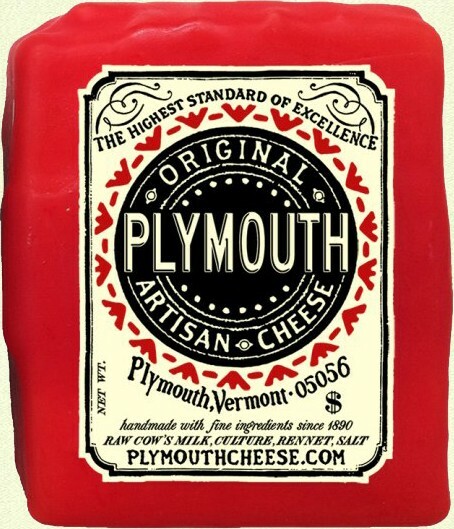 The Original Plymouth Cheese is sharp and full-bodied with notes of butter, fruit and nuts. Mmmmm! You can visit the Plymouth Cheese Factory! There’s a small but fascinating on-site museum and an opportunity to take a self-guided cheese factory tour. Big windows look into the cheesemaking rooms and, if they’re producing that day, you’ll be able to watch the process first hand! If you really want to see the process, call ahead to see if they’re going to be making cheese the day you hope to visit. Deer Brook Inn, in Woodstock, Vermont, is just 15 minutes drive from the historic Plymouth Cheese Factory. Our stylish, 1820’s farmhouse inn offers distinctive yet Vermont casual lodging. Enjoy spacious rooms with ensuite bathrooms and individual thermostat control. Many have skylights for natural light by day and entrancing starscapes at night. Book tomorrow’s relaxation today at Deer Brook Inn!